Hey everyone, I hope you’re enjoying a fun March break if you’re off this week! We finally decided to book a quick trip to Arizona to visit my parents…even though after our December holiday travel shenanigans I vowed I wouldn’t fly with Arlo again until he’s older and less squirmy…lol. Spoiler alert: he is at peak squirminess these days, but when you’re over winter, you’re over winter, am I right? I think we’re all counting down the days until we are soaking up the sun! Q1. Hi! 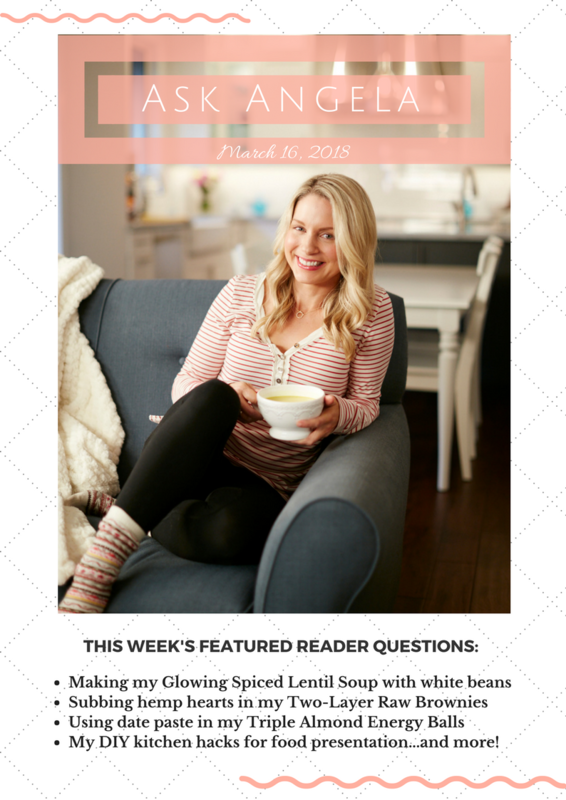 My husband and I LOVE your Glowing Spiced Lentil Soup. Amazing. We were thinking of switching it up a tad and using white beans instead of lentils. Any thoughts? Hey Reagan, So happy you both love it so much! It’s on regular rotation over here. :) I recently tested a version with canned white beans (added at the end with the spinach) and reduced the broth to 1 cup since there were no red lentils soaking it up. To be honest, I didn’t like this alternative as much as the original—maybe because I reduced the liquid and that threw off the flavours, or maybe I’m just so used to the tried-and-true Glowing Spiced Lentil Soup recipe at this point! #changeishard, lol. I also used light coconut milk instead of full-fat and that could’ve made the soup less rich and tasty than usual. I’d probably suggest making the recipe as-is and then adding a drained can of beans at the end if you’re looking to add beans for texture. I’d love to hear how it goes if you try it out! Q2. 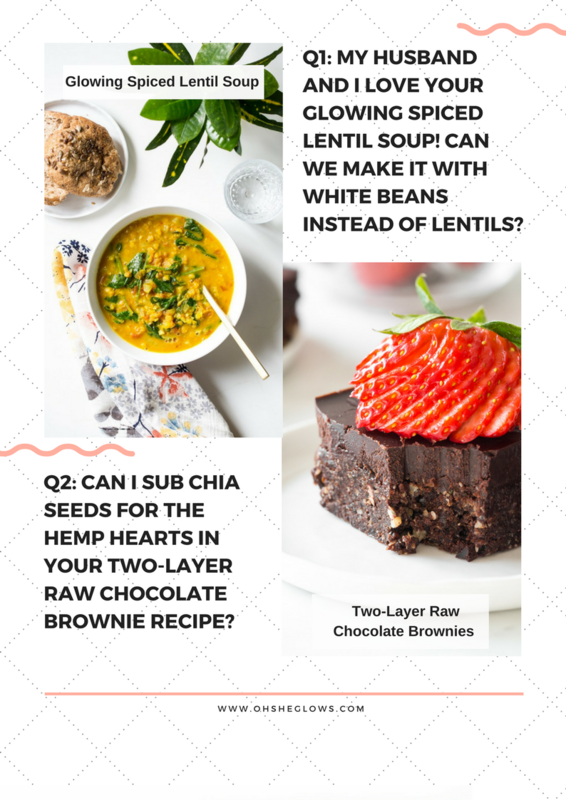 Could I swap chia seeds for the hemp hearts in your Two-Layer Raw Chocolate Brownies? Hey Katrina, Chia seeds are much crunchier than those soft and tender hemp hearts, so I probably wouldn’t opt for a 1:1 ratio swapping them here. 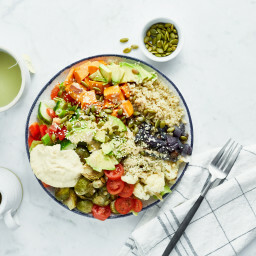 I was curious about your question so I decided to try out a hemp heart-free version for you! I used 1 1/2 cups walnut pieces (this amount doesn’t include the 1/3 cup walnuts called for at the end of the recipe) and 1 tablespoon of chia seeds. It worked great! As I mentioned, chia seeds are pretty crunchy, so if you don’t mind the extra crunch factor, you could probably double up to 2 tablespoons of chia seeds based on preference. I found the cocoa powder’s flavour was a bit more intense in this version, so you may want to try adding a bit less than 1/2 cup cocoa powder to taste. Q3. 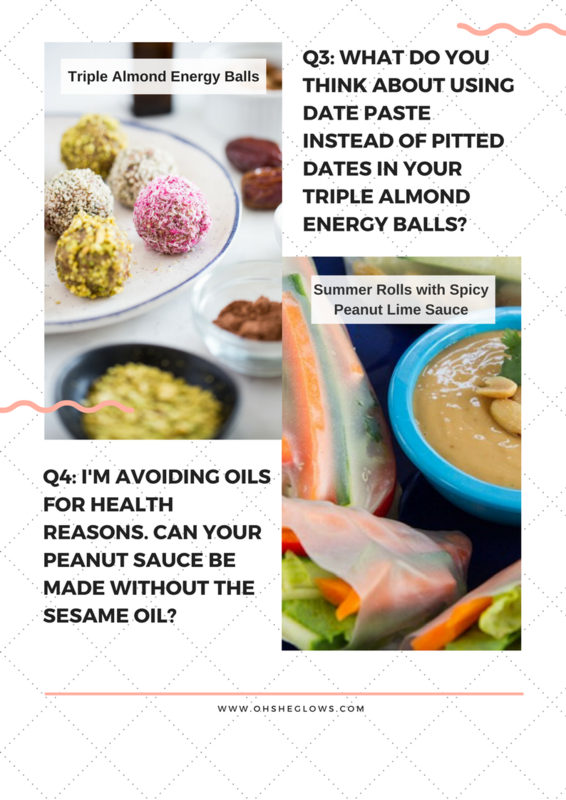 Could I use date paste instead of pitted Medjool dates in your Triple Almond Energy Ball recipe? Hey Donna, I think date paste is a blend of pitted dates and water, so I can’t see why you wouldn’t be able to make it work with a bit of experimenting! My main concern is whether the date paste would bind the dough as well as the pitted date version. I would try starting with 3 to 4 tablespoons of date paste and going from there until the right dough consistency is achieved. If it’s still too dry (or simply not sweet enough), add a bit more date paste and process it again. You may also need to use a bit less water if the date paste contains some on its own. Q4. Your Spicy Peanut Lime Sauce reminds me of the peanut sauce I used to get at Thai restaurants. Delish! However I am trying to reverse heart disease by avoiding oil in my diet, so I can’t make this sauce with the sesame oil called for. Any suggestions? Hey Rebecca, I’m so happy you love this peanut sauce so much! I tried a version swapping the sesame oil with an equal amount of water and it worked great. The peanut sauce might not be quite as rich-tasting, but since there’s 1/4 cup peanut butter in the sauce I found that it was still plenty creamy! Q5. 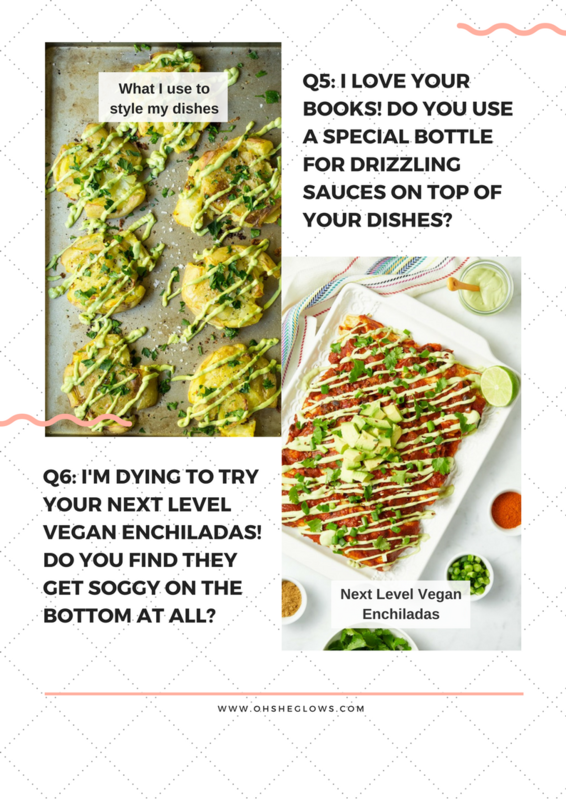 Hi Angela, I love your books and am curious if you use a particular bottle for garnishing foods with chocolate drizzles, salad dressings, etc. My presentation could do with some improvement! Hey Arn, Oh can I relate to your struggle with food presentation! I’ve been wanting to pick up one of those cute lil’ squeeze bottles for decorating, but it keeps slipping my mind! Normally, I just use a small spoon or fork for drizzling or a baggie with the corner snipped off for “piping.” Nothing too fancy going down over here! 😅😂 In the photo of my Crispy Smashed Potatoes (above), I filled a small bag with the Avocado Garlic Aioli and snipped off a corner to create a little hole. Then I “piped” the sauce on my potatoes from there. Of course this isn’t necessary for the dish (I can tell you it tastes just as delicious with straight-up dollops of sauce! ), but it sure looks pretty. Hey Trish, They can get a bit soggy depending on the type of tortilla that you use. I’d suggest using a heartier tortilla like the Food for Life Ezekiel 4:9 Sprouted Whole Grain Tortillas. I like those ones because they’re thick and dense, and should hold up a bit better than traditional white flour tortillas in this recipe. Hey Jill, That’s so sweet your son specifically asked for this soup! A parent’s dream. 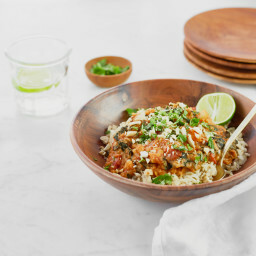 ;) I love that you make it with black lentils on occasion…I’ll have to try that soon. A mix of lentil varieties might be fun too. Thanks for sharing! I definitely need to try the raw chocolate brownies. Looks delicious! You sure do! haha. I love them because they can be stores in the freezer for little treats when you get chocolate cravings. Lucky me, I got to test this version out this week so I have a stash (for now). I cannot wait to try your brownies. I’m ashamed to admit that I have only made the box kind. Yuck. Yours look so rich and scrumptious. Sounds like your visit to Arizona was fun! Was there once and it’s inspiring a room in my house that I’m doing in Southwest style. A little silly in Buffalo, NY, but I don’t care. Love cacti!!!!!! 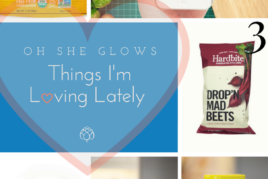 Hey verna, You can sign up for our newsletter at http://www.ohsheglows.com/newsletter and be sure to confirm your subscription when the email comes in (check your spam as well if you don’t see it). Hope this helps! I always wondered about the drizzling on the photos.. It really just is a ziplock bag? I will need to start doing this for instagram photos :D thanks for the easy tip. I wanted to comment on substituting date paste for dates. I haven’t tried it in this recipe, but I frequently substitute date paste for dates in recipes for energy balls and bars. I often find date paste at a lower price than dates, and I find the date paste doesn’t disappear before I have a chance to use it. My family members see those dates and say: YUM, I am eating this NOW. That’s so good to know, thanks Mary Ellen! Do you recall what ratio you use when you swap out pitted dates for date paste? I am a huge fan of your recipes (I own both cookbooks and purchased your beautiful OSG app) and was wondering if you have any suggestions on which recipes make the best “freezer meal” options! Perhaps you’ve already answered this questions before? If so, oops and please let me know where to find the answer. I’m currently 39 weeks pregnant and trying to food prep as much as possible before baby arrives. I already have your Soul-Soothing African Peanut Stew and zucchini muffin tops in my freezer :) Thank you!! Hey Angela, Congrats on your pregnancy! You must be so excited. I’m glad you found that blog post…it’s actually reminded me that I should update the post with my new freezer-friendly recipes! Thank you. I hope it helps in the meantime. #askangela with the weather getting warmer I’m wandering what sunscreens you recommend that are vegan? 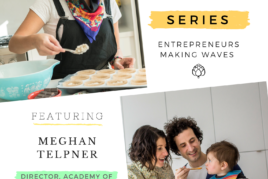 And for the kiddos? Hey Leslie, Oh good question! I wrote about the sunscreens we use in my favourite products page: http://ohsheglows.com/my-favourite-skin-care-products/ The one we use for all purpose family spray is by Alba. hope this helps! This is super helpful! Love the Q&A posts you’ve been doing! Thank you, Maria! I’m so happy you’re enjoying the posts!